Most chefs have an obsession. At least one obsession. It could be technique, equipment, a rare and maybe even secret ingredient? Most have a healthy obsession with their knives. It’s one of the first things I learned in culinary school; how to have a healthy relationship with my knives. At Natural Gourmet Institute we spent a ridiculous amount of time cutting produce. It’s a plant-based curriculum after all. The result? Chefs with great knife skills! (Not to mention creating a bit more OCD in some of us, but that’s for later.) Most of my colleagues and I were constantly admired by chefs, sous chefs and other cooks at our internships or new jobs for our ability to cut uniformly, accurately and quickly. (The latter was my biggest weakness.) It takes time, but it’s worth it. Why is it worth it? Because even cuts make for more beautiful and tastier dishes. If everything is cut evenly, everything cooks evenly. This is probably not news to you yet we often don’t think about size or uniformity when cooking at home. To be fair, we have a million and one other things to think about than the perfect dice, but a little bit of practice will take your meals to a whole new level. We could get into a lengthy conversation about knives, sharpening tools, other kitchen equipment that cut, slice, chop, mince, etc, but I think it’s best to keep it simple. I’ll list some sources so you can get into the nitty gritty of knives if you wish to. Let’s start with the most basic and most used knife; the chef’s knife. It’s also known as a French knife (of course) and is pretty much a multi-purpose knife. It’s typically 8-12″ in length and about 1.5-2″ wide at the heel (base). It tapers from there to a point at the tip. This construction allows for the knife to peel, mince, chop, trim, fillet a fish, break down poultry and otherwise work meat, etc. To be sure that you have a good knife, check the balance between the blade and the handle. It should be even and pretty easy for you to hold. You’ll use this knife for everything…pretty much everything. Buy a good one. The second oft used knife is the paring knife. It’s used mostly for trimming and paring produce. Its short 2-4″ blade usually resembles that of the chef’s knife. I’ve seen chefs use the paring knife for dicing brunoise cuts (discussed later) and even in trimming fat from meat. It’s versatile and it will make your life easier in the kitchen. Buy a good one. Buy a good one does not mean buy an expensive one. There are plenty good quality knives that won’t cost you a 2nd mortgage on your house. Just get help from people who know what they’re talking about when buying. Chop: When you see the term “roughly chopped” or just chopped, it generally means “cut into pieces about the same size but exact uniformity and dimensions aren’t really important”. This is probably what most of us usually end up doing. Dice: There are a few sizes to the basic dice, the beautiful little cubes that can adorn any plate! How do you get to those beautiful little cubes? Well, it largely depends on what you’re cutting. Some things lend themselves to certain cuts. 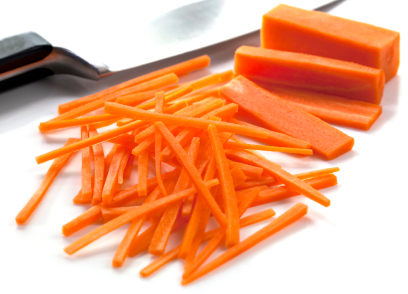 Potatoes and carrots get cut into planks first (see image above in the meantime), then rods and then dice. The onion is a special vegetable and gets its own set of rules.